This programmable kettle is all about letting you choose when you want the kettle to boil your water and even how long you want it to keep the water hot for. You also have 5 different temperatures already programmed in that will let you steep your different varieties of tea or coffee. The kettle has simple +/- buttons that are easy for anyone to use. Hamilton Beach prides itself in only bringing new products into the market that solve the problems that were there with their predecessors. For example, their teapots and kettles are all designed with increased functionality making them more convenient than a majority of the other brand manufacturers in the game. Below are the top Hamilton Beach teapots & teakettles. 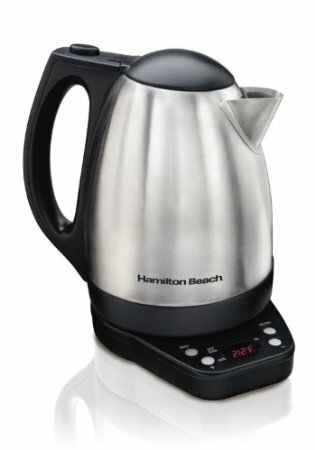 If you are looking for the best teakettles and teapots from Hamilton Beach then they should have made it into this top 10 list. Each of them is a well thought out product you can invest in with a smile. Whether you are looking to buy an electric kettle or a teapot, whether you want to compare various brands or even when you want to see which model from one specific manufacturer is the best, the TheTeaSupply.com reviews will get you to the most viable conclusions. Check out all the tea product reviews from the TheTeaSupply.com!